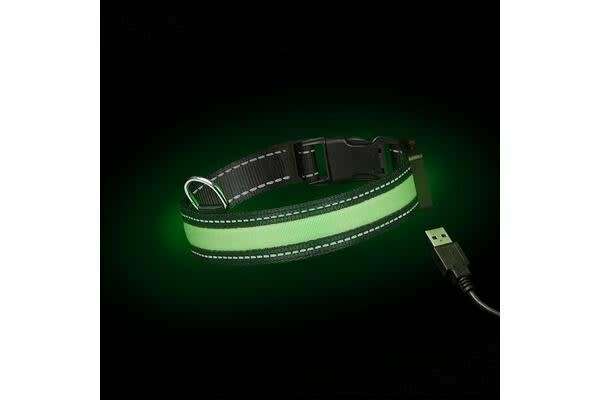 Designed specifically to provide you ; your dog with maximum visibility during evening walks, the electronic Loomo Moonshine LED Dog Collar Green is made of extra durable nylon webbing and comes with three flashing modes – quick, slow and steady-on. Eco-friendly and water resistant, the Loomo Moonshine LED Dog Collar Green is the ultimate choice for night-time explorations. The package also includes a USB rechargeable battery and a USB recharger power cable which connects directly to the collar. No more spending money on those expensive and fiddly batteries! Durable and sturdy, it comes with battery life of up to 20 hours from just one USB charge! It’s stylish enough to be used as your dog’s everyday collar too! The Loomo Moonshine LED Dog Collar Green is also available in, blue and red. The Loomo Moonshine LED Dog Collar Green is available in the following sizes: Small 26-40cm adjustable. Medium 35-50cm adjustable. Large 45-60cm adjustable. The Loomo Story: Every year more of us are walking our dogs at night and, more cats are leaving their apartments to explore the world. The unfortunate result is that, every year there are more and more things going wrong. Any pet owner who ever spent time in the waiting room of an all-night vet has probably been witness to some of these. Its one of those things you never think will happen to you until it does. Luckily there are simple ways to reduce the risk for you and your loving pet. Walking time can be one of the most exciting times of the day for your dog. But depending on your dog and where you are walking, it can be uncomfortable for you and not safe for either of you. Thats why having the dog walking accessories that most suit you and your needs is important. These days LED accessories for your pet are affordable, easy to use, high quality, and very effective at minimising these risks. Whether it be an LED collar or collar light attachment, or an LED harness or coat, or even just an LED lead, they will dramatically increase your pets visibility at night. Loomo is a reliable Australian owned brand promising quality LED products you can count on. Loomo is committed to helping Australians solve this problem and make our loving pets and their owners as safe as possible. The majority of Loomos products are USB rechargeable so you never have to worry about batteries again!